With Christmas over, it is a great time to look back on what was most important. Was it, giving and receiving presents? Watching Christmas films and eating too many mince pies? Maybe so, but the most important thing for Elsie at Castleford Lodge, was being with family. Elsie and her three daughters very rarely get the chance to all see each other, so as a part of Castleford Lodge’s fantastic Make A Wish programme, Elsie’s only wish was to be able to see her daughters all together. Activity Co-Ordinators, Tracey Lee and Elaine Beedle invited Elsie’s three daughters to visit the home for an evening of celebrity treatment. 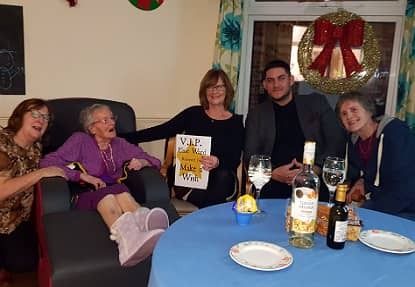 Castleford Lodge had already booked entertainer, Alan Turner, so Tracey and Elaine set up Elsie’s very own VIP table, complete with bottles of wine, snacks and other treats. Before the night began, Elsie was given full star treatment, as she was dressed in her best clothes and jewellery, ready for her special family evening. Elsie joined her daughters at their own VIP table and kicked back to watch the live entertainment. “We are very proud to have been a part of something, that Elsie’s family will treasure forever.” added Elaine. As a gift, Tracey and Elaine gave Elsie’s family some personalised wine glasses, as a memento of their wonderful evening.